Nature’s restorative, joy-inducing fusion of sun, sea and sand is one of the purest luxuries known to humankind – the warm feeling of the sun on your skin, the sand beneath your feet and the sea kissing your toes. The Beach Clubs at Aman destinations celebrate every aspect of this fusion, providing the finest beach experience on some of the globe’s most picturesque and pristine stretches of coastline. Spaces in which to absorb the sights, sounds and tastes of the ocean in consummate comfort, Aman Beach Clubs provide both the peace and seclusion that counteract the frenetic pace of modern life, as well as the convivial energy inspired by balmy days and nights. Destinations that facilitate escape and quiet communion with nature, every Aman Beach Club is also an exclusive venue where sandy feet, cocktails and sun-kissed friends and family toast life in summer’s golden light. 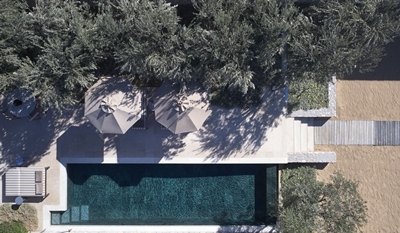 Each Aman Beach Club is a unique expression of its setting, whether on the tropical shores of Pamalican Island at Amanpulo, the legendary beaches of the Peloponnese at Amanzoe or the protected coves of the Turks & Caicos at Amanyara. More than just beautifully designed structures providing restaurants, lounging decks, dressing rooms and water sports, each is a frame and platform for the beach lifestyle of the destination it reflects. Many boast expansive swimming pools just steps from the sand, others have tucked away beachfront bales or open-air gymnasiums. Some offer surfing lessons on the region’s finest breaks; others environmental turtle-tagging and guided snorkelling expeditions on world-class reefs. At every Beach Club, Aman’s impeccable, intuitive service is a given, as are all-encompassing sea views and dreamy sunset locations for romantic private dining or festive beach BBQs. Aman boutiques offer exclusive swim and beachwear, and guest suites feature complimentary woven beach bags and sunhats as mementos. Even Aman Wellness also plays its part, with a number of Beach Clubs hosting early morning yoga classes and beach bootcamp sessions. Amanpuri – Year Round (Closed June) Lapped by the turquoise waters of the Andaman Sea on the west coast of Phuket, Amanpuri is situated on a private peninsula within a grove of swaying coconut palms. A sweep of stone steps descends from the main swimming pool to the secluded white crescent of Pansea Beach and the resort’s exclusive Beach Club. Offering a Mediterranean-inspired restaurant, a lounging terrace, cocktail bar and sun loungers overlooking a 20-metre swimming pool, the Beach Club is as popular by day as it is by night. The resident DJ spins a mellow beach vibe from late afternoon into the evening, when the pool is lit and guests can enjoy signature drinks, superb fresh seafood and wood-fired pizzas beneath the stars. During peak season, the Beach Club is a favourite destination for several themed dinners and events including its iconic New Year’s Eve afterparty. In the daylight hours, guests can explore the surrounding coastline aboard Hobie Cats, kayaks, SUPS (Stand Up Paddleboards), boogie boards as well as venture beneath the water’s surface using Amanpuri’s snorkelling equipment. For those seeking an adrenaline rush, waterskiing and wakeboarding are available, and guests can also enjoy exhilarating new water sport activities including riding Schiller bikes over the surface of the sea, exploring up to 3 metres beneath the waves with Seabob ‘scooters’, acrobatic over-water airtime with Flyboards, Stand Up Jet Ski’s and electric Lampuga Surfboards, and cruising the shoreline with Hobie Mirage pedal boards. Amanpuri offers PADI-accredited dive programmes year round, and there is also a beach float anchored about 70 metres from the beach and at 6 metres in diameter, there’s plenty of room for sunbathing. Named Samut Thevi, Sanskrit for ‘Goddess of the Sea’, the float is also ideal for sundowners, and a nearby reef is flush with fish to discover. Amanruya – April to October Set on a forested hillside overlooking Mandalya Bay, Amanruya lives up to its name ‘Peaceful Dream’ on Turkey’s idyllic Bodrum Peninsula. Protected by a headland and wrapped around a number of well-established trees, the resort’s informal Beach Club consists of a series of terraces on which sun loungers overlook a quaint pebble beach and a wooden jetty – inviting guests to leap into the azure waters of the bay. The Beach Club restaurant serves Turkish-inspired Mediterranean cuisine and home-baked breads that can be dipped in locally-pressed olive oil and savoured in the dappled sunlight. A range of non-motorised water sports equipment is available, but this is a Beach Club that is the antithesis of Bodrum’s bustle – its seclusion and peace harking back to ancient times. As Amanruya reawakens this summer, its Beach Club is set to become a hideaway spot for those seeking relaxing time out in beautiful natural surrounds. Greece is a country renowned for its beaches and expectations are always high. Yet Amanzoe’s own private beach on the Peloponnese Peninsula exceeds every one. Stretched across a beautiful bay with sparkling turquoise waters, the beach lies a short drive or gentle mountain bike ride from the hilltop resort and is backed by a magnificent Beach Club designed to host guests from dawn to dusk and beyond. Providing four swimming pools including two 25-metre lap pools, the Beach Club’s distinguishing feature is its network of expansive marble decks. These flow between and around the swimming pools, inviting guests to relax on loungers in the sun or beneath shady pergolas, pause in the bar for a freshly squeezed juice or signature cocktail, or dine in the expansive restaurant serving local seafood, wood-fired pizzas and fresh salads. Regular beach BBQs with live music are held during the summer months and children are entertained with a range of child-friendly beach activities, while adults can enjoy water sports from windsurfing and paddleboarding, to kayaking and sailing, with expert assistance. Excursions to explore the bay and nearby islands can also be arranged by boat along with sunrise yoga sessions accompanied by the sound of the waves lapping the shore. As well as a spa area and a small gym, additional unique features of Amanzoe’s Beach Club are the four Beach Cabanas each available for day use for up to four adults or for an overnight stay for two. Situated directly on the beach, these spacious air-conditioned Cabanas provide all the comforts of a Guest Pavilion with bedroom, bathroom and dressing room, as well as a terrace, an almost 200-square-metre garden and a private swimming pool overlooking the sea. Amanzoe guests can reserve a Cabana and enjoy a day on the beach, swimming in the sea, discovering pristine coves by kayak, and sunbathing in complete privacy. 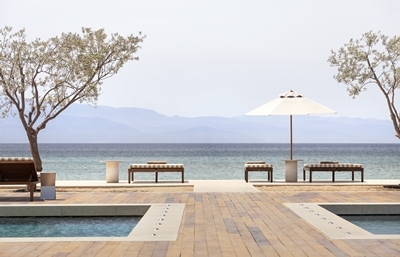 Amanzoe is open from April through to December with the Beach Club open from May to October. Aman Sveti Stefan – May to October (Villa Milocer – Year Round) Attracted by Aman Sveti Stefan’s unique location encompassing a fabled island village, a historic villa on the mainland and a spectacular stretch of Montenegrin coastline, many guests only realise on arrival that the resort is also a stellar beach destination. The estate incorporates no less than three pink sandy beaches, including the Adriatic jewel – Queen’s Beach which is backed by a magnificent lawn and forest surrounding the resort’s standalone Aman Spa. Sun loungers line the beach and the outdoor portion of the spa swimming pool, and day beds rest beneath the cyprus trees that shade the lawn. New for the 2018 season, a restaurant on Queen’s Beach serves an extensive beach BBQ menu for lunch and private beach BBQ’s for dinner. Offering freshly caught seafood and local specialties with a range of salads and sides, this casual alfresco venue offers feet-in-the-sand dining at its best – with extraordinary sea and island views. Guests can also enjoy a new spa menu of boost juices, protein smoothies, power bowls, seasonal fruit salads and ice pops on the beach. Amankila – Year Round Perched on Bali’s east coast with regal Mount Agung as its backdrop, Amankila is a cliffside resort overlooking the Lombok Strait. With its iconic three-tiered swimming pool and panoramic sea views, it is the resort’s Beach Club that comes as a delightful surprise for many guests. Located below the resort, set back from the beach in a peaceful coconut grove, the Beach Club is surrounded by verdant tropical gardens. Partially shaded by a frangipani tree, the Beach Club swimming pool – Amankila’s largest – is overlooked by the Terrace Restaurant, which offers both indoor and outdoor settings. Nearby in leafy seclusion are a number of open-air massage pavilions, a yoga bale, as well as a new outdoor gym, crafted almost entirely of bamboo. From the Beach Club, a short stroll on a sandy path through dense vegetation leads to the resort’s private black-sand beach. Eight secluded lounging bales are set along the sand – each tucked into the foliage for added privacy, but with beautiful sea views. Drinks and light meals can be enjoyed within the bales during the daytime, and romantic private dining with a bonfire can be arranged in the evenings. For exclusive use, Karang Sari, a clifftop platform is located on the eastern edge of the beach and allows guests to enjoy private dining set ups as well as sunset cocktails with views across the Lombok Strait. Amanpulo – Year Round The epitome of a tropical island retreat, Amanpulo encompasses the entire island of Pamalican in Palawan archipelago. This paradise in the Philippines is fringed by beaches and pristine coral reefs, and in essence is a Beach Club in its natural form. The resort’s eponymous Beach Club Restaurant with its casual dining area, lounging deck and eclectic Mediterranean fare is situated on the western side of the island and is the ideal spot for all-day lounging and watching the sun set. Adjacent is the Sea Sports Hut, from which a host of water sport activities can be enjoyed. These include kayaking, paddleboarding, pedal boarding, Hobie Cat sailing, Sea Bob experiences, guided snorkelling expeditions, fishing trips, boat trips to Manamoc Island and sunset cruises. On the opposite side of the island lies the Windsurf Hut, with expert windsurfing and kite-surfing pros on hand to offer lessons during the season of November to March, and a rustic pizza restaurant providing sustenance. The eastern side of the island is also home to Amanpulo’s turtle hatchery. When the timing is right, guests can join in the memorable experience of releasing newly-hatched turtles into the sea. Guests can also get up close and personal with the island’s underwater inhabitants while scuba diving with Amanpulo’s scuba masters, or simply by snorkelling off the Kawayan Bar – a floating sundeck opposite the Beach Club. 2018 will be the first year that Amanpulo launches its dolphin interaction programme – an exciting opportunity for guests to encounter dolphins in the wild. Amanyara – Year Round Renowned for its crystal blue water and powder white sand, Providenciales in the Turks & Caicos Islands is a premiere destination for beach and water sports enthusiasts. Set on the serene northwest coast, Amanyara features a Beach Club and Nature Discovery Centre enabling guests to enjoy the resort’s pristine coastal and marine environment to the full. Overlooking the resort’s 1,000-metre long white-sand beach, Amanyara’s Beach Club offers a restaurant, cocktail bar and lounging deck with panoramic beach and sea views. The restaurant serves raw dishes as well as Caribbean, Latin American and Mediterranean-inspired cuisine. Cooking classes, rum and wine tastings, chocolate making and other activities are regularly hosted at the Beach Club, as well as larger private events, beach BBQs and a legendary New Year’s Eve party with global acts providing entertainment. A range of complimentary water sports equipment, from Hobie Cats and SUPS, to ocean kayaks and Sea Bobs are available, and a guided complimentary snorkelling trip departs three times daily from the beach to a nearby coral head. At Amanyara’s Nature Discovery Centre, environmental programmes and nature experiences await guests of all ages. Guests can take part in Amanyara’s conservation work with sea turtles, helping to flipper-tag endangered green and hawksbill turtles. They can also learn more about the resort’s Adopt-a-Coral programme, which is playing a pivotal role in the preservation and regeneration of the region’s coral reefs. Amanoi – Year Round Set between Nui Chua National park and a marine reserve, Amanoi embraces nature from its beachside perch on the remote southern coast of Vietnam. Overlooked by magnificent granite cliffs, the Beach Club is located on the sandy white beach of Vinh Hy Bay – known as one of country’s most picturesque. A destination unto itself designed to maximise sea views, the Beach Club offers a spacious open-sided restaurant specialising in celebratory breakfasts, Vietnamese dishes and seafood feasts. Sun loungers line the dramatic swimming pool – its curves mimicking the seashore just metres away, and guests can enjoy sunrise yoga sessions on the Beach Club deck, framed by huge granite boulders. Strenuous beach bootcamp sessions invite a refreshing dip in the sea or swimming pool afterwards, before a shower and a well-deserved breakfast. For those seeking a more intimate escape, journey by boat along the croppy coastline to the Twilight Cliff Lounge, set on a natural rock cliff, to watch as the sun sets over Amanoi’s sloped roofs. The pristine waters of Vinh Hy Bay are ideal for exploration, both along the craggy coastline and under the deep blue, where colourful coral and schools of tropical fish reside. The Beach Club provides a full range of water sports equipment: Hobie Cats offer sea adventure to experienced sailors and novices alike, while guided kayaking expeditions and snorkelling trips explore granite rock formations and discover over 300 species of coral. Sand sculpture artists are available to entertain children and adults alike.